YOUR FAVORITE ACCESSORY IS HERE! This one-of-a-kind, high-end quality durable tobacco crusher tool that comes in the shape of the BB8 droid from the last Star Wars trilogy will certainly become your more trusty grinding companion! EXCELLENT & FINE GRINDING! Thanks to our deluxe top grinder\'s razor-sharp daimond metal teeth, you can rest assured that you will have the finest, most perfectly cut pollen, regardless of whether you\'re grinding tobacco or spices! LET BB8 KEEP YOUR HERBS FRESH AND NEAT! 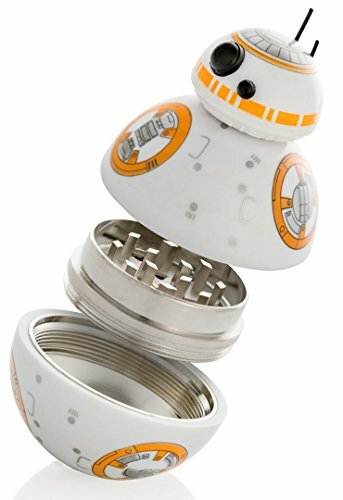 Seal your freshly cut buds or tobacco inside your new little BB8 grinder and enjoy them anytime, anywhere you like; they will still taste like you\'ve just ground them! THE BEST GIFT FOR STAR WARS LOVER! Sure, R2D2 rocks, but it\'s not a secret that little BB8 has managed to steal the hearts of every single Star Wars fan out there; hence they will love this amazing present idea! SUPREME CONSTRUCTION QUALITY! We, at Rekkles Grinders, make a point by utilizing only the best quality materials for our accessories, so that you can enjoy them for a long, long time of use! Cute little grinder. Great for any Star Wars nerd. Great for a star was fan. A bit smaller than expected but still works great! Great Grinder for your herbs. So so cute, love it! !